There are over 17,000 elm trees in Brighton & Hove. There are large numbers of elm trees in Preston Park, Shirley Drive, Carden Hill and The Level. These sites include many species of elm trees including English, Jersey and Cornish Elms. 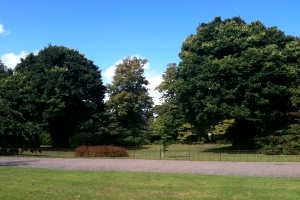 The 'Preston Twins' at Preston Park are considered to be the largest and oldest surviving English Elms in Europe. They are also home to a colony of elm-dependent White-letter Hairstreak butterflies, a species which has been on the decline in areas that have suffered with Elm Disease. This endangered species lives mainly in the treetops, and they rely on the elm trees for food. There is a large and nationally-important collection of elm trees at The Level. The trees frame the perimeter of the park and also support a colony of White-letter Hairstreak butterflies. The wildlife of The Level, and the elm trees in particular, feature heavily in the education elements of the park's community volunteer-led activities plan. Most of the elm trees in Brighton & Hove were planted by the Victorians and Edwardians. 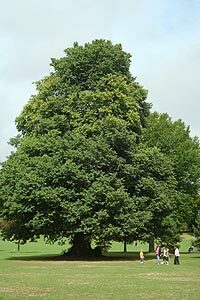 Elm trees were popular because they can tolerate thin chalk soil and salty winds. In the early 1970s the council introduced a new programme to control a highly infectious form of elm disease which was introduced by imported Rock Elm from North America. The success of the programme to fight the disease is still clear today from the many thousands of elm trees throughout the city. In 1998, due to the success of the local Elm disease control programme, the city was granted full National Collection status by Plant Heritage. The council's tree specialists are committed to containing Elm disease and extending the range of trees in the National Collection. They do this by safeguarding the mature Elm trees and at the same time, seek to extend the range of species as they become available. Find out how to identify an Elm on the Natural History Museum's website. Go to the council's trees web page for more information.